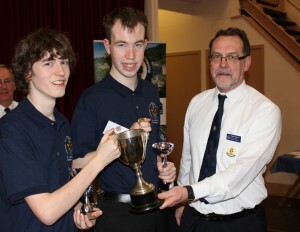 A Boys’ Brigade chess team from 1st Bearsden Company has made all the right moves as they took home first prize at the Brigade Chess Finals. BB teams made up of members from 7th Edinburgh, 1st Bearsden, 1st Ardshaw and 1st Cheslyn Hay Companies used skills, commitment and concentration in order to make it through the regional heats and compete in the finals at Middle Parish Church Halls in Coatbridge on Saturday 25 March. But it was John McEwan, Alistair Ramsey and Fergus Hempel from 1st Bearsden that beat off the competition to be crowned overall winners following at tie-break with 1st Cheslyn Hay. "It was an incredibly competitive tournament. For a sport that is often considered 'boring', it was great to see the spectators fully engaged and I highly doubt they would have described the chess games in this way. Despite the inevitable high stakes, the tournament was conducted in a friendly manner and was thoroughly enjoyable. My only regret is not competing in previous years." "It was a very tense few games but we held our nerve. I'm really pleased we won - it was the first Scottish and UK championship for our company. Fulton MacGregor MSP for Coatbridge and Chryston visited the groups during the competition with Rev Derek Gunn conducting the opening devotions. Bill Stevenson, brigade Secretary and Alistair Burrow, Vice President and BB officer with 1st Bearsden were also in attendance during the finals. “I'm absolutely delighted for John, Alistair and Fergus. The competition started back in October and since then they've been taking each round as it comes. The guys were ecstatic about reaching the Scottish finals and elated when they won it. 1st Cheslyn Hay were runners up, 3rd place was 1st Ardshaw from Northern Ireland and 7th Edinburgh took 4th place. Along with Chess, there are national competitions in: Table-tennis, Masterteam, Badminton and Five-aside Football. Please accept apologies for this oversight. This has now been corrected.